During the perioperative period, specialised nursing care is needed during each phase of treatment. 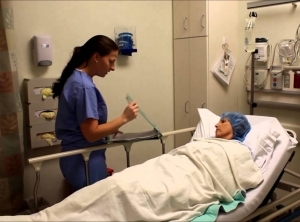 For nurses to give effective and competent care, they need to understand the full perioperative experience for the patient. Perioperative refers to the three phases of surgery. Within these stages there are many different roles for nurses and different care needed for the patient dependent on which stage they are in. As with any nursing care, the goal during these stages is to provide holistic and evidence based care as well as support to the individual. There are different nursing roles throughout the perioperative process including: admissions nurse, anaesthetic nurse, circulating nurse or scout nurse, instrument or scrub nurse, post anaesthesia care unit (PACU) nurse and the surgical ward nurse. Other nurses may be included in the perioperative process such as pain management specialist nurses, diabetes educators, hospital in the home nurses and wound care specialists. For those working in these roles or wishing to work in this specialised area, it is best practice to have an understanding of the complete perioperative process from the patient’s point of view as well as a sound understating of your role requirements. Day surgery is now common practice in Australia which involves the patient being admitted and prepared for the procedure, undergoing the procedure and being discharged home on the same day. It is generally done for less complex or less invasive surgical procedures in which limited anaesthesia is required. Approximately 60% of all procedures are done as day surgery procedures within Australia. Individual patients will have different psychological and emotional responses to surgery influenced by the type of surgery they are having and why they require that surgery. Think of Mary as your patient. She is a 63-year-old woman with colorectal cancer who has had a bowel resection with the formation of a stoma. The surgery removed the entire cancerous portion of her bowel and potentially left her cancer free. Now let’s think of Jane. She is also 63 years old and has had a bowel resection due to severe Crohn’s disease. She was told the resection was necessary for a certain abscess in her bowel and she may experience some relief from her current symptoms but they can’t be certain. She is also informed there is no cure for her condition and she may require further surgery. As you can imagine, the psychological and emotional responses of these two women will be vastly different. Mary is most likely relieved and happy about her prognosis whereas Jane may be angry that her disease will be a part of her life forever, she may become depressed, anxious and fear the future. How do you, as a nurse, respond to these two women? Providing reassurance and support is one of the most important roles for a nurse during the surgical process. Providing information to the patient and their family can allay fears. Anxiety of the unknown can be decreased when information is provided. It is also important to encourage the patient to communicate their fears and concerns so you can have an opportunity to address their concerns. Regardless of if the patient is undergoing major or minor surgery, the prospect of any procedure can cause anxiety in individuals. It is also important to remember that a person’s spiritual and cultural beliefs can also impact on how they cope with preoperative fear and anxiety. Due to anxiety about the procedure the individual may have difficulty retaining information, therefore information may also need to be repeated at times. Information should also be presented to the individual in language that they understand. Sometimes written information can also be presented to the individual for assistance with the retention of information. The goal of effective preoperative care is to ‘ensure the individual is in the best physical and psychological condition possible before undergoing surgery’. Preoperative care begins when the decision to have surgery is first considered and ends when the patient is transferred onto the operating table and the intraoperative period beings. The length of the preoperative phase can vary. For example, it may be a planned surgery such as a total knee replacement in which the preoperative period would be longer than when compared to an emergency surgery such as an appendectomy. It also depends on the amount of time it takes to adequately prepare the patient for surgery, such as if bowel preparation needs to take effect prior to the surgery or if the patient needs to be fasting. Data must be gathered about the individual’s health status including baseline observations and an accurate nursing history. This will help identify any actual or potential problems which may impact on the individual and allow prevention strategies to be implemented. The patient’s age: the very young and very old are generally more at risk of complications because of their physiological status. Nutrition: compromised nutritional status can lead to impaired tissue repair and decreased resistance to infection. Obesity: obesity can impact on respiratory and cardiac function during surgery. There are also other factors to consider such as the presence of diabetes and cardiovascular disease. They generally also experience decreased wound healing ability and are at an increased risk of infections. Preoperative information required to be provided to the patient includes postoperative activities to be expected (such as deep breathing and coughing and early mobilisation), pain management, and any other specific information relevant to the type of surgery they are having and to the individual themselves. Providing this information is not only important to reduce the risk of postoperative complications but it also gives the individual a positive role to play in their own recovery and can help to decrease potential anxiety. This information should be provided over a period of time, starting at the preadmission visit rather than just prior to the surgery when the individual is likely to be at their most anxious. If you have the opportunity, getting the individual to practice e deep breathing and coughing prior to surgery is beneficial as they then know what to expect. Explain why early mobilisation is important, such as in the prevention of a Deep Vein Thrombosis (DVT) occurring, if your patient is at risk of a DVT you would want to inform them of the use of TED stockings including the measuring and ordering of them prior to the surgery. The taking of a comprehensive medical and nursing history of the patient is vital to provide holistic care. Individuals often present with comorbidities in addition to their surgical presentation and these can impact on their recovery and vice versa. It is also important to ensure these factors are stabilised prior to surgery. Consider if the person is a diabetic and needs to fast prior to surgery - they are most likely one of the first on the surgery list in order to prevent hypoglycaemia. Perhaps the patient is on anticoagulants which must be ceased prior to surgery to ensure excessive post-operative bleeding does not occur. Do they have a disability that requires assistive devices? Is the person a smoker? If so, they will need to cease smoking a few days prior to surgery to increase their respiratory function. This extract is from the Pre and Post-Operative Care tutorial authored by Sally Moyle, BNurs, MNurs, RN, CNS. The complete tutorial on Pre and Post-Operative Care discusses the information presented here in more details and covers pre-operative preparation, surgical risk factors, pre-operative checklist including consent, patient with special consideration, barriers to effective pre-operative care and complications of surgery. Even if you do not work in this specialised area of nursing, this is an informative tutorial to undertake as it gives detailed information of the patient’s surgical experience from beginning to end. Reading this excerpt and reflecting on it will give you 30 minutes toward your annual COD. Undertaking the complete tutorial will give you 2.5 hours of CPD. To access the complete tutorial go to http://anmf.cliniciansmatrix.com. If you have any questions, please contact the ANMF on education@anmf.org.au. This article was republished with permission of the Australian Nursing and Midwifery Federation.